"Here is a rare and original testimony to a fascinating world that few of us know anything about. David Zurick has captured the soul of a place. A very patient and very loving look at a community that played an important role in India's history and culture." "On misty winter mornings in Shekhawati, the vibrant colors pierce the fog, the shapes of magnificent havelis loom out of the mist, and the streets and desert roads bustle with quiet activity. David Zurick has captured a remarkable sense of place here, which will transport any viewer to some of the world’s greatest cultural marvels, inhabited by the friendliest and hardest-working people you are ever likely to meet." Order from the Goff Books or Amazon. Watch book trailer. Silver Award Winner 2018 Nautilus Book Awards! “This book is a journey into the depths of life and our contemporary challenges. Rarely have I seen the local and global more elegantly juxtaposed. The result is nothing short of masterful." Order from the Shanti Arts or Amazon. Watch book trailer. Land of Pure Vision explores the topic of sacred geography through a series of black and white, large format photographs recounting the artist's picture pilgrimage across Tibet and the Himalaya. It interweaves holy places into a cohesive landscape of transcendent beauty and inspiration. The Oscar-nominated film director Eric Valli describes this work as "a love story; a wide and long pilgrimage," and internationally-acclaimed literary critic Jonathan Mirsky calls it "evocative, alive, luminous, and masterful." Order from the University Press of Kentucky or Amazon. Watch book trailer. Offers a fresh visual perspective on one of the nation's most distinct regions. Zurick's blending of insight and artistic vision is a model for landscape photographers to emulate for years to come (book jacket). "The intersection of geography and photography proves a stunningly fruitful combination in Southern Crossings. The photographs and text embody a striking precision of place." - Charles Reagan Wilson, Professor of Southern Studies, University of Michigan (book jacket). "Those who think they know the South... will learn things aren't always what they seem." The Charleston Post and Courier. Order from the University of Georgia Press or Amazon. 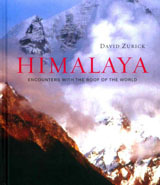 "For more than thirty-five years, David Zurick-one of the world's foremost experts and writers on the Himalaya-has been trekking this remote, dramatic region and documenting its magnificent geographical features. In this, his third book on the Himalaya, Zurick offers a different and more personal appraisal of the region, detailing his own intimate experiences with the environment and the people who live there. 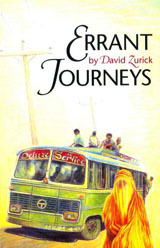 In a clear, conversational style, Zurick covers a wide array of topics, from the interplay of different religions in Kathmandu to the economic and social changes transpiring in Bhutan to the fragile frontier of Tibet (Amazon book description). "This book works its magic admirably." - Tom Fricke, Professor of Anthropology, University Michigan (book jacket). Order from the University of Chicago Press or Amazon. WINNER, National Outdoor Book Award. "Brilliant... with clarity and passion," San Fransisco Chronicle. "Cartographic triumph," Foreward Magazine. "Everything you could ever want to know of the Himalaya," Seattle Times. "Simply gorgeous," Missoulian Sunday. "A fascinating read," Geographical, Royal Geographical Society. "Remarkable... with this atlas Zurick is joining the legendary chroniclers of the Himalaya," Geographical Review. Order from the University Press of Kentucky or Amazon. German language edition of Illustrated Atlas of the Himalaya. 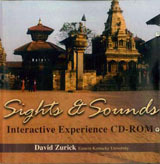 This interactive CD provides an overview of world region through music and photographs. Available in limited supply from McGraw-Hill Publishers. 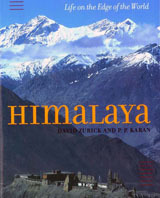 "Thoroughly researched, engagingly-written, and lavishly illustrated, Himalaya provides a compelling account of the mountain range's natural history, cultural diversity, environmental predicament, and future survival." (book jacket). "Amply illustrated, and written in a style suitable for both academics and mountain lovers, [Himalaya] tells the beauty of the mountains." Mountain Forum. FINALIST, Banff Mountain Book Award. "A profoundly self-reflective meditation on the political, cultural, spiritual, and ecological ramifications of an adventure travel industry that's driven by 'the West's own disenchantment with itself' (book jacket). "Zurick may not dissuade you from taking your next trip, but he's sure to change the way you experience it." OUTSIDE Magazine. "David Zurick writes with an intensity that comes from having seen these places himself." - James Duncan, Professor of Geography, Cambridge University (book jacket). "For Hawaii-bound visitors seeking natural beauty, historical sites, and the culture that supports environmental activities, botanical gardens, and special nature programs. 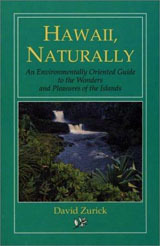 Following an introduction to the creation of the islands, Zurick discusses alternative energy, aquaculture, hiking, camping, preserves, parks, recycling, water sports, and environmental education. Island by island, he reviews natural attractions, activities, and alternative lodgings. 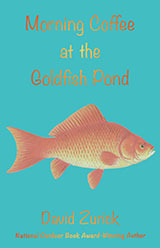 Useful, concise, and well written, this will interest campers, younger, budget-constrained visitors, and naturalists." The Library Journal.